Puffed Cotton belongs in the category 'white', but surely has more to offer. Her light pink blush makes it look like she is standing in the light of the sunset. Puffed Cotton’s colour is similar to the colour of Brother Chuck. They both have a salmon pink heart and petals with a touch of light pink. This flower is definitely a golden hour peony: pure perfection. The size of Puffed Cotton is also quite special. In the bud, the flower measures already four-and-a-half centimetres and can reach a size up to 25 centimetres! That’s an amazing size for a peony. Further, the flowers are completely double. Puffed Cotton was seen in bloom for the first time in 1993. Ten years later, she got registered by Roy Klehm. 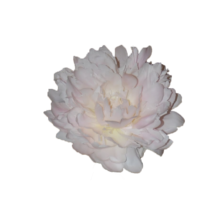 Puffed Cotton is one of our most exclusive peonies. That’s why this peony will be available for only a limited time. For the upcoming years, she will continue to be a premium peony for the dedicated peony fans. Do you think you belong to this category? Then you should know that this peony will be blossoming in our gardens at the beginning of June. Keep track of our stock!